Ticket sales now closed! Draw takes place Wednesday 16th December. Good luck! 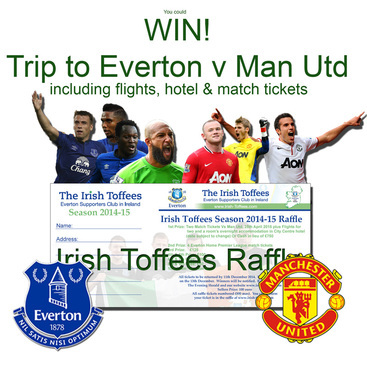 The Irish Toffees - Everton Supporters Club Raffle is here again! Many thanks to all those who have sold and returned ticket stubs. If you would like to enter the raffle or require more tickets please enter raffle online by clicking on button above. You do not require a paypal account. 2nd Prize: Four Everton Home Premier League match tickets. All posted tickets to be received by December 15th. Draw will take place on December 17th. Winners will be notified. Results published in the Evening Herald and on our website www.irish-toffees.com. Seller of top prize raffle ticket receives 100 euro. All raffle tickets numbered individually (500 max). You can confirm that your individually numbered raffle ticket has been received by us and is in the draw by viewing a list before the raffle of all received raffle tickets below. Good luck!